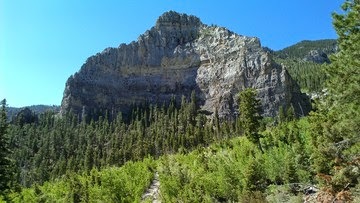 Half a mile further along Hwy-157 from Mary Jane Falls, the Cathedral Rock Trail sets off from a roadside parking lot. Starting at 7600 feet and climbing a further thousand feet along a rough but not very steep footpath, the three-mile round trip can be pretty grueling for anyone unused to such elevations. The hike is moderately strenuous, 3 miles round-trip, and will take approximately 2.5 hours. En route to the top of the promontory known as Cathedral Rock, you have to circle around Mazive Canyon, by way of denuded hillsides cleared by countless winter avalanches. You're eventually rewarded with views all the way back down Kyle Canyon - though not as far as Las Vegas - as well as onward to Charleston Peak. Its smooth bald dome is the only point in the mountains that pokes out above the tree line. To get there take US 95 north from Las Vegas to State Highway 157/Kyle Canyon Road. Turn left and follow the road to the Cathedral Rock parking area which is approximately 100 yards prior to the Mt. Charleston Lodge. You'll see the uphill road to the parking area directly ahead of you just prior to the lodge.